As we’ve moved through the story of helium, I’ve found that I know a little less about each topic. We’re now on the next-to-last entry, and its a topic about which I knew close to nothing until I did some research. So if I’ve convinced you through the first ten entries in this series that I know a little about things, this entry will dissuade you of that notion. But here goes, anyway. Here’s a video of what happens when liquid helium reaches 2.17 K. Yes, it’s in Greek. Somehow that makes it even cooler. When helium-4 reaches 2.17 K and even colder, all the helium atoms in the sample act like a single atom. This explains why the boiling stops; boiling is the process of some atoms (with more energy) escaping and other atoms (with less energy) staying behind. That’s why sweating cools you off; the evaporating sweat carries away heat energy, leaving cooler liquid on your skin. But if all the atoms in a sample of liquid helium are behaving as a single atom, then none of them can have more energy than any other. They must all have exactly the same energy, and so boiling isn’t possible! Notice in the video how the boiling stops the moment the temperature reaches 2.17 K. When that transition occurs, you are looking at what amounts to a single atom! But why that temperature? This is the part that blows my mind. There’s this thing called the Heisenberg Uncertainty Principle. It essentially says you can’t have perfect knowledge about two related variables at the same time. In the case of these helium atoms, you can’t know both their position and their momentum. Momentum is related to speed, and speed to temperature. At a particular temperature (you guessed it, 2.17 K), we know a lot about the atoms’ momenta (because it doesn’t have much). As a result of narrowing down the momentum knowledge, our knowledge about the atoms’ positions becomes worse – bad enough that we can’t tell any two atoms apart! Quantum uncertainty means that the atoms overlap! There’s one further detail here. Only some kinds of atoms can overlap this way. If you remember a couple of posts ago, I wrote about the idea of the Pauli Exclusion Principle, and I hinted that it didn’t always apply. Well, here’s where it doesn’t apply. The reason is number again. Helium-4, with 2 protons, 2 neutrons, and 2 electrons, has 6 particles all with half-integer spin. Big deal, right? It is a big deal, because you can’t add together 6 halves and end up with anything other than a whole. Try it! This means helium-4 always has a whole number of spin. And particles with a whole number of spin don’t obey the Pauli Exclusion Principle! Helium-3, with only 1 neutron, won’t do what helium-4 does (ok, yes it will, but only at much, much lower temperatures, and for a reason that is thankfully “beyond the scope of this blog entry”), because helium-3 has 5 particles with half-integer spin. But helium-4, with a whole number of spin, behaves in this strange way that electrons can’t. Helium-4 atoms can all be in the same exact state. Crazy! That might not excite you too much, but maybe this will. If this liquid helium really is, now, a single atom, then maybe it can start to do some of the weird things atoms do. For instance, atoms can interfere with themselves. One of the weirdest things about quantum mechanics is that, because atoms have a wavelength, atoms passed through double slits can create interference patterns just like light beams. Well, quantum mechanics works for atoms, but surely it doesn’t work for things as large as that sample of liquid helium in a test tube? Or does it? Sir Anthony Leggett, at a lecture I attended a few years ago, suggested an experiment aimed at testing this idea. Once we have this superfluid, macroscopic single atom of liquid helium, let’s try to make it interfere. Do we get interference patterns? If we do, then quantum mechanics applies to the macroscopic world of cats, turtles, and you and me. If we don’t, and we can eliminate any other errors, then there must be other, “hidden” laws of nature that draw a line between microscopic quantum weirdness and the macroscopic world we live in. As far as I know, the experiment hasn’t been done yet. 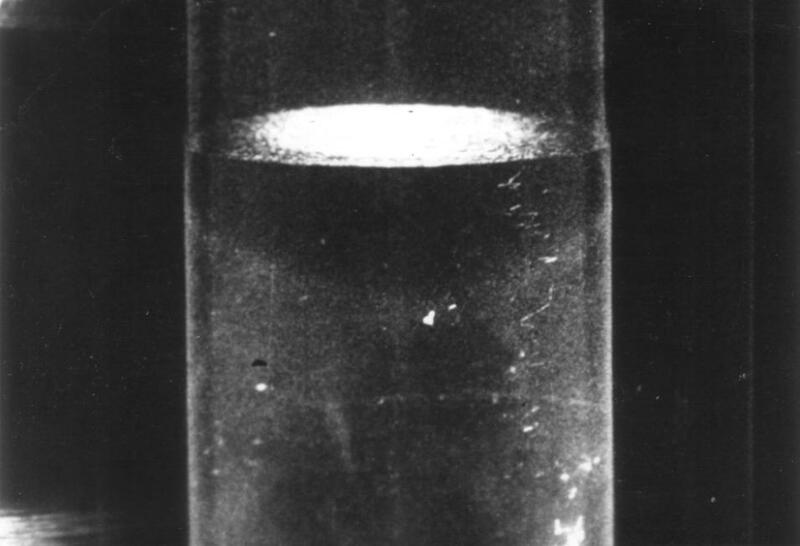 But other experiments with helium-4, including things like quantized vortices in the spinning fluid and this property of near-zero viscosity, point in one direction. Macroscopic quantum effects are real. Quantum mechanics really does describe our world, not just the world of atoms, but the large world of people and peanut butter sandwiches. Go back and look at that video again. You’re looking at a single, quantum mechanical “atom” made of billions upon billions of individual helium atoms, each of which has lost its own identity to quantum weirdness. And that is crazy cool!